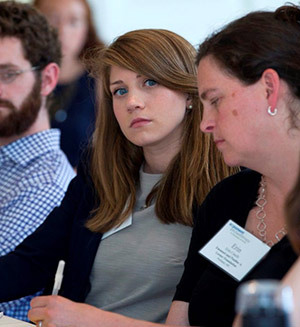 What does a day look like in the life of a philanthropic studies student? We’re about to show you. In this series, three students in three different academic programs (Ph.D., M.A., and B.A.) take you inside their lives for a day to show you what it’s like learning, living, and breathing philanthropy. 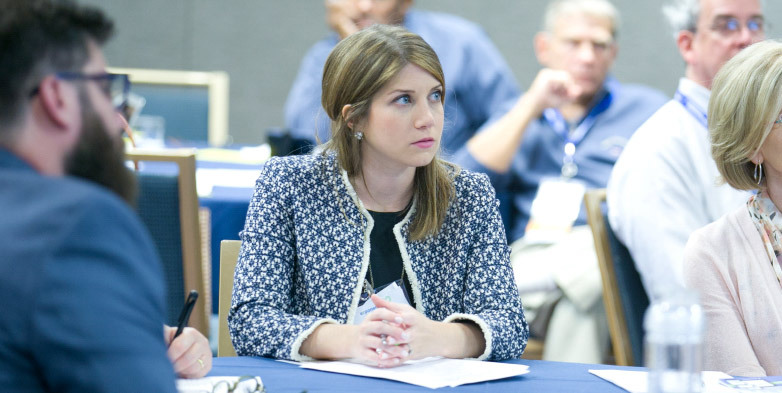 This week we highlight a day in the life of executive master’s student Jenny Convey. Officially having made it over halfway through her second semester in the executive master’s program at the Lilly Family School of Philanthropy, Jenny is starting to get the hang of the balancing act between working in a very high-paced job as a nonprofit consultant while also being back in school; not to mention her extracurricular commitments as a board member at a philanthropic foundation and as co-chair of the Next Gen giving group at her local community foundation. It is certainly a challenge to fit it all in on any given day! Having majored as an undergrad in classical studies, with a focus on ancient Roman history, she loves, by contrast, how current and relevant the coursework in the philanthropic studies M.A. program is to her career in the nonprofit sector. Her clients turn to Jenny and her firm, Giving Tree Associates, for sound advice and the most up-to-date information in the field, and what she learns in her courses directly builds her expertise for this work helping nonprofits grow and thrive in her day job. It was this thirst to dive deeper and continue to educate herself in the most important topics in the world of philanthropy—both in her professional life and in her capacity as a board member with her family’s foundation—that drove Jenny’s interest in the Lilly Family School of Philanthropy. As soon as the master’s program offered the option to complete the entire degree online, she jumped at the chance to enroll. The remote coursework meshes especially well with her schedule, having developed the discipline required for teleworking through her job, where she works from home (when not in client meetings!). Still, during busy work-weeks, she tends to find herself burning the midnight oil to get her schoolwork done, and it can be a challenge to squeeze in enough quality time with her husband, friends and family. But she is grateful for this flexible option for earning the degree, and has absolutely loved her courses so far, with her favorite being Grantmaking and the Role of Foundations, a particular interest of Jenny’s due to her work with her family’s foundation. 8:30 a.m. – Much needed dose of caffeine, courtesy of my husband’s homemade cold brew. 8:45 a.m. – Jump in the car and head out to the biweekly staff meeting for my firm, Giving Tree Associates. 9:30 a.m. – Arrive at the home of the firm’s principal/co-founder: so much cozier than your typical staff meeting, and we always have a delicious breakfast spread of berries, avocado, and bagels! 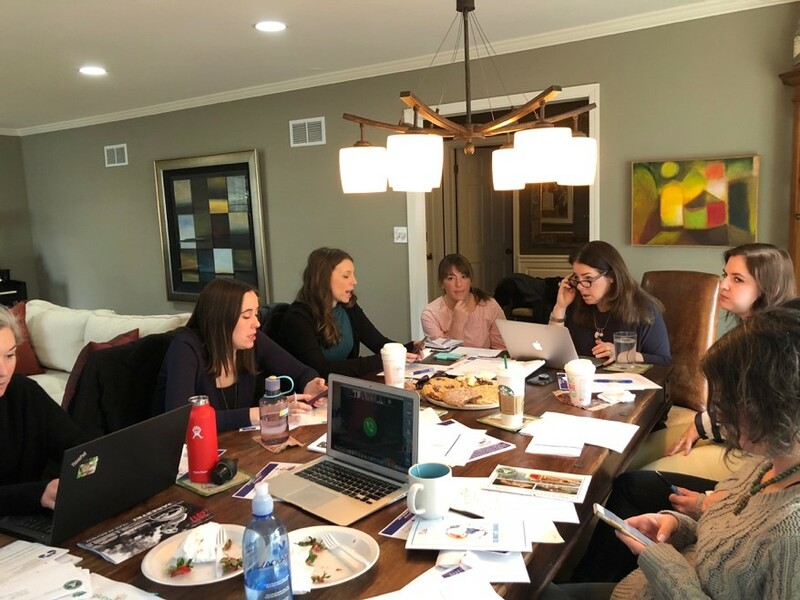 I love staff meetings because, as a remote office, these meetings serve as our opportunity to catch up with each other and put our heads together to problem-solve any roadblocks our clients are having and to share new information or best practices in the nonprofit sector. Plus, if there is a birthday, we get to eat cookies. I am a sucker for treats! 10:30 a.m. – Each staff meeting includes built-in learning opportunities: today’s “tool of the day” is all about Facebook Fundraising Tools, and my coworker, Jackie, gives a fascinating lightning talk on the Blackbaud Institute 2017 Global Trends in Giving Report, from which we learn that 73 percent of donors to nonprofits are women, compared to 27 percent who are male, among other trends. 11:30 a.m. – Staff meeting ends. I quickly send a few client emails, grab a bagel, and head downtown (Chicago) for a Speaker Series the firm is hosting. 12 p.m. – Arrive at the Speaker Series. 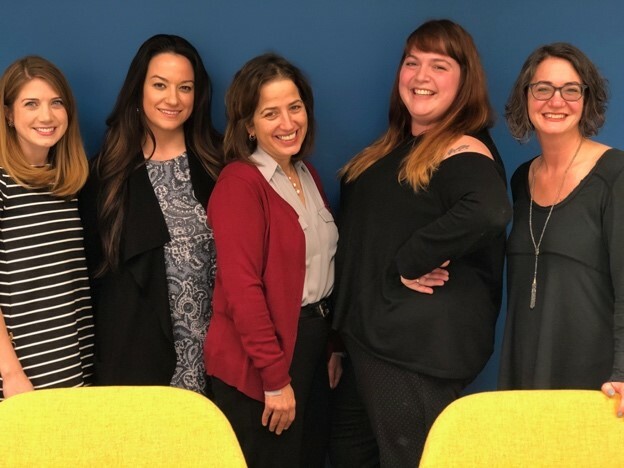 The panel is on “Eliminating Sexual Harassment in the Nonprofit Workplace,” a topic that I had covered during my own lightning talk at a recent staff meeting, and wrote a blog post around. As a women-owned and staffed firm, the issue really hit home for our team, and we felt it was so timely and important that we wanted to bring it to a wider audience. The expert panel was fantastic and most of the audience opted to stay late to continue the riveting Q&A session. 1:30 p.m. – Dash over to my weekly meeting with one of my favorite clients, the Jewish Council on Urban Affairs (JCUA), in the Ravenswood neighborhood of Chicago. JCUA is an incredible nonprofit organization working to advance systemic change through community organizing around issues like police accountability and immigration justice, and the team is just fabulous. I’m so glad I get to work with them! 4 p.m. – Hop over to another client meeting—for Reading In Motion, a children’s literacy nonprofit—where we run a fundraising solicitation training for the organization’s 35th Anniversary Gala committee. Practice, practice, practice! 6 p.m. – Back to Oak Park, where I live, for a meeting at the Oak Park Community Foundation. I am the co-chair of a Next Gen giving group—Next Gen Leaders in Philanthropy—that gives out small capacity building grants to local nonprofits. 7:30 p.m. – HOME! (Finally!) Time to eat dinner with my husband, and I’m starving! 8:30 p.m. – Finish this module’s reading about the social sector in Egypt for my course on Civil Society in Comparative Perspective, and post in the online discussion. 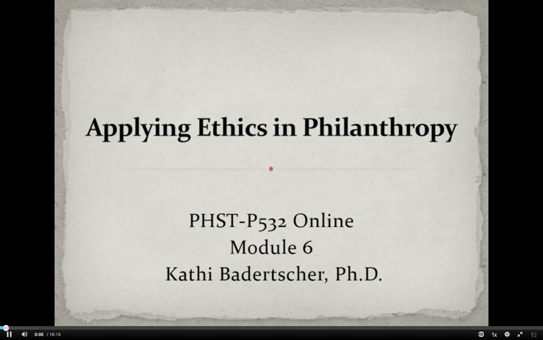 10 p.m. – Listen to Dr. Badertscher’s lecture on the ethical management of nonprofit organizations for my other course this semester, Applying Ethics in Philanthropy, and then crack open the reading for this module. 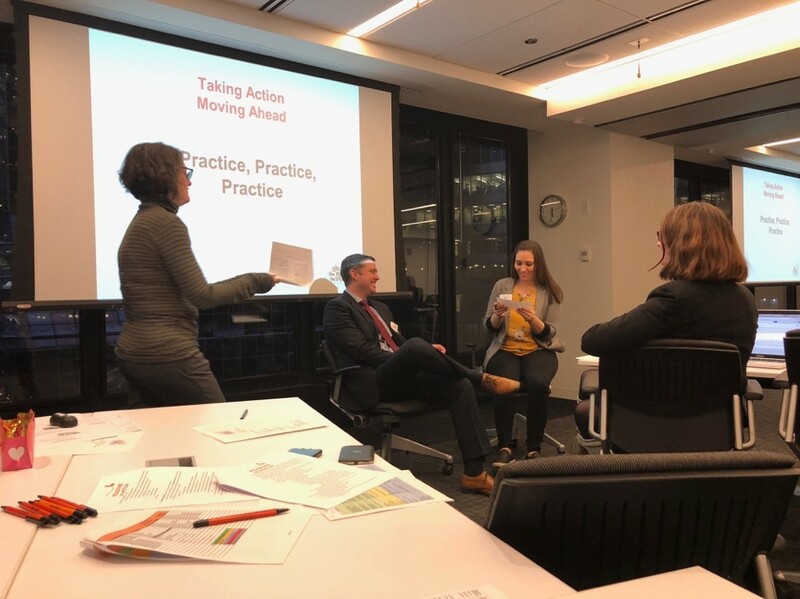 This is a reading week, so I won’t be posting in the discussion until next week, but the readings are all about ways nonprofits can put ethical considerations into practice, which is giving me a lot to think about, both for my clients and my family foundation. Midnight – Time to pass out: my husband has already been asleep for over an hour, and I am jealous! But can’t wait to do it all again tomorrow.